Calypso is the most famous transgender cabaret show in Bangkok running for over 28 years. It is housed in a 480-seat theatre within the Asiatique riverfront entertainment complex. There are 2 daily shows at 20.15 & 21.45. The show features music and dance performances by a host of transgender performers. The show features Lady GaGa, Elvis, Beyoncé, Geisha, Chinese ballads, traditional Thai dance and lots more. Note that the singing is not live but is lip-synched. Tickets are available online, at the box office or from booking agents. You can save money by booking your tickets online. There is also a pre-show dinner and show option at 1500(online)/2000 baht for adults and 1200 baht for children. The dinner is a set Thai menu served in calypso’s own restaurant with a choice of regular, vegetarian or Muslim. Note that you need to request the vegetarian and Muslim options when booking. The dinner includes a Khon dancing show. The dinner times are 18.30 for the 20.15 show and 20.30 for the 21.45 show. There is a host of drinking and dining options in the Asiatique complex as well as some good shopping. Location: Asiatique The Riverfront, 2194 Charoenkrung 72-76 Rd, Bangkok. Show and dinner: Adults 1500 baht, Children 1200 baht. BTS: Take BTS Skytrain to Saphan Taksin station (exit 2), go to the pier and take the Asiatique free shuttle boat. 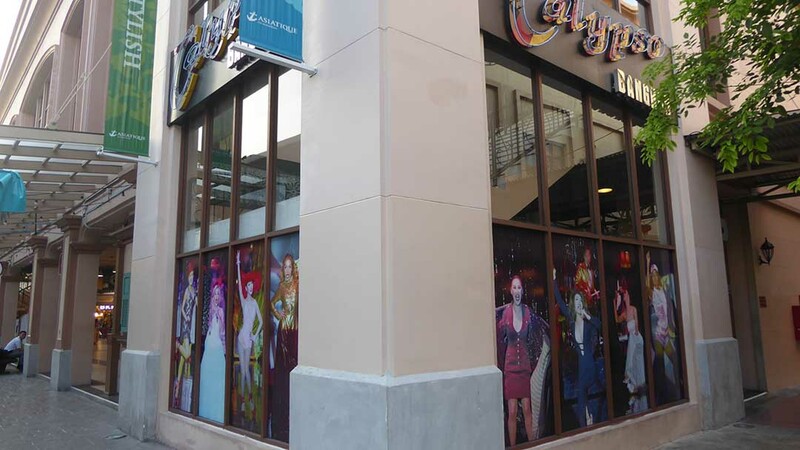 Calypso is located within the Asiatique complex in warehouse number 3. Hotel Shuttle Boat: The following hotels offer a free shuttle boat service to Asiatique. Anantara, Shangri-La, Millenium Hilton, The Peninsula, Ramada, Chatrium, Oriental, Royal Orchid Sheraton. Taxi: Take a taxi to Asiatique.